Not necessarily everything in hotel is expensive. A great example will be Crumbles and Cream Cafe, a very Instagrammable cafe within Iconic Hotel in Icon City. Delicately crafted desserts. Best for both photos and appetite. Monthly revised High Tea Set. This makes every trip here full with expectations! 50% off for cake counter selection for people having birthday on that month! Order a second main course at 20% discount! 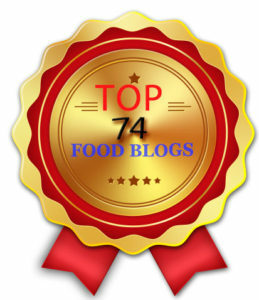 Devoted Chef Ong which is passionate about food presentation and taste. Look at the exquisite high tea set launched from 1st January till 28th of February 2019. Competitively priced at RM 98+ per set for 2 pax, the high tea set is served on a mini replica picnic table, and you can pick the choice of tea from 4 available options - Rose Bud, Lavender, Earl Grey or Chamomile. Coffee is available at additional cost. French influences are strong in the dessert list as showcased by presence of Éclair and Macaroons. We enjoyed the macaroons here as it comes with a light crust, and not overwhelming with sweetness. On top of that, the homemade nougats are another worthy highlight with soft and nutty texture that will not glue all over your teeth. 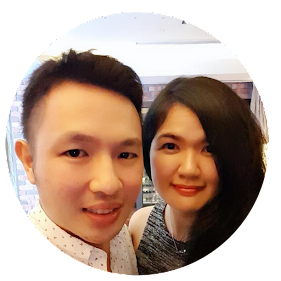 To balance the sugar rush arising from the desserts, Chef Ong slotted a range of savoury items such as chicken pies, tuna and turkey roll for you to play around with your tongue. Switch between sweet and savoury to cleanse your taste buds while reducing the fatigue arising from having too much sweet stuff. Still having conundrum where to go for Valentine day? Then Crumbles and Cream have a special Valentine high tea set with an unique menu which is available on 14th February 2019 only. It is priced at RM 108+ per set and available from 12 - 7 pm. 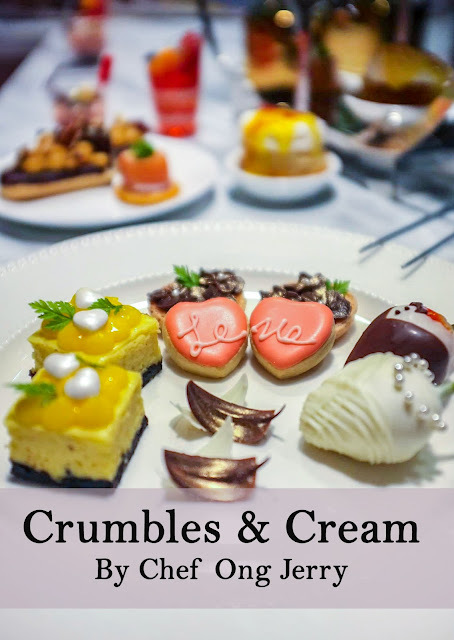 At the same time, Crumbles and Cream also offers a good range of desserts and we leverage the visit to sample some of them. Yes, it was a true treat to our palate. One fine exemplary dessert here is Orange Ganache (RM 10.90+). The creative combination of chocolate and orange gives a great balance between richness from the chocolate and sweetness contributed by the sugar. As cocoa tends to give a tad of bitterness, the chef has incorporated some heat elements to give it a slight spicy aftertaste to mask it. If you are a cheese fanatic, then Double Cheese (RM 10.90+) will definitely drive you into craze. Humongous richness from the cheese that melts in mouth is no men or ladies will resist. If you prefer something lighter, then pick Strawberry Joconde (RM 10.90+) that offers sweet and spongy texture. Sometimes a good evening is best spent doing nothing and just talking with your other half or buddies. In this case, order a Le Souffle (RM 18.90+), a dessert that needs 30 minutes preparation time. Every souffle is made upon order, ensuring a fresh souffle garnished with mix nuts and ice cream. Conventionally, vanilla ice cream is served but other options are available. Give Drew Berry More (RM 32.90+) a shot if you are searching for a lofty dessert. 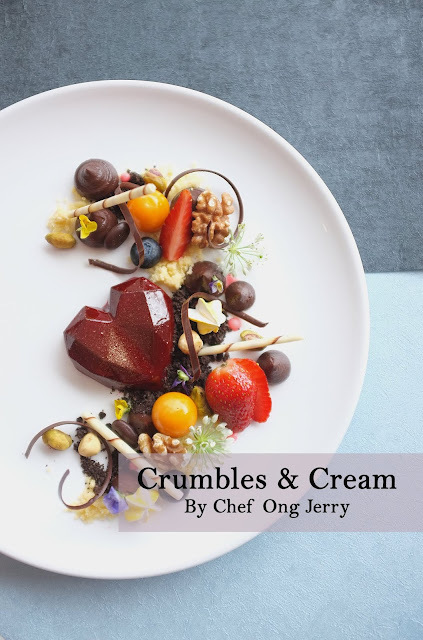 It has a big scoop of chocolate ice cream, served along with mixed berries and oreo choco powder, then garnished with truffle oil to give it an aromatic finishing. Every bits of it is dynamite. A worthy mention here is about the ice cream made in Crumbles and Cream. As most patrons are here to enjoy good food, taking pictures are a must concurrently. Therefore, the chef has specially made their ice cream with less milk with compact ingredients to slow down the melting process, allowing you to enjoy taking photos with the food without worrying much. There will be horoscope dessert available here according to horoscope time. Please check with the crew in charge for your unique horoscope dessert, as different creation are uniquely crafted that best describe your horoscope characteristics. For a more solid and stomach fulfilling food, there are a series of main course too. We thoroughly enjoyed the All Black Pasta, Squid Ink Vongole (RM 28.90), and thus far it is one of the best squid ink pasta we have tasted. The spaghetti noodles are al-dente and comes with the right amount of heat component to give it a more enthusiastic enjoyment. The plate has lightly sauteed garlic, dried chili flakes, chives, dill, cherry tomato confit and olive oil, then served along shell calms and prawns. Parmesan cheese and truffle oil are sprinkled on top of it to give it a sleek and aromatic finishing. Not to forget to check out the signature drinks here - Crazy Shakes (RM 16.90+). It is perfectly Instagrammable! 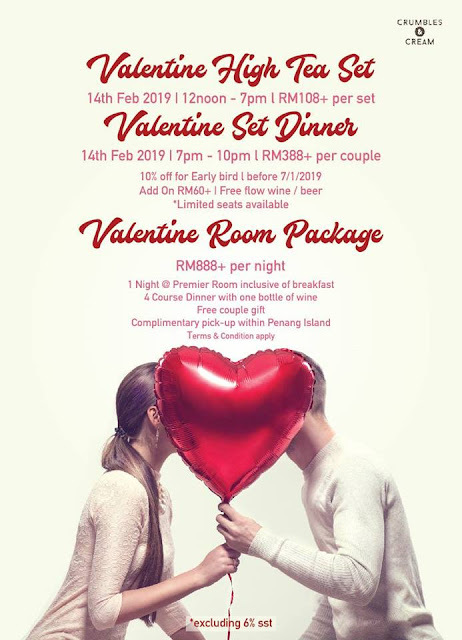 Crumbles and Cream also launched a Valentine Set Dinner which is available on 14th February 2019, from 7 pm to 10 pm. It is priced at RM 388+ per couple, and add on RM 60+ for free flow of wine and beer. Check out the following food that will be served during Valentine Set Dinner.